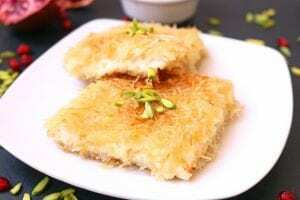 Put your kunafa in the oven for 35/40 minutes or until the top turns a nice golden brown colour. Do not allow to burn. Remove from oven and drizzle the sugar syrup on top of your kunafa as required. This entry was posted in Uncategorized by Sarah Digon. Bookmark the permalink.